Neglecting the petrosal bulla and a few other pedantries of uncertain adaptive significance, there is widespread agreement that some of the most important shared primate attributes reflecting something about the adaptive context of primate origins include the following: (1) grasping hands and feet with nails rather than claws, and locomotion utilizing diagonal footfall patterns, (2) notable development of functional stereoscopy through orbital convergence, (3) large brain relative to body size, and (4) relatively small litters and reduced developmental rates. There is no particular reason to believe that primate origins involved a near-simultaneous acquisition of all these traits in one grand evolutionary event. Rather, they must have been acquired one after the other, probably each one by subtle degrees, over the course of significant geological time, and involving several nested adaptive radiations. The fossil record of anthropoid origins—a particularly well-known "origins" event—have demonstrated how the discovery of more and more fossil intermediates between extant-grade prosimians and extant-grade anthropoids breaks down the assemblage of shared specializations initially believed to characterize the dichotomy (Simons and Rasmussen, 1995, 1996). The earliest undoubted anthropoids do have postorbital closure, but not fusion of the mandibular symphysis, reduction of the molar trigonids, brain enlargement, or other formerly diagnostic characters. Similarly, fossils demonstrate that the origin of hominids involved acquisition of bipedalism first, followed much later by significant expansion of the brain and extensive use of stone tools. (Remember that one century ago this simple fact was unknown and was an issue of debate; this example also serves to show how we can acquire confident knowledge about unique historical events through the fossil record, in contrast to Cartmill, 1990). Undoubtedly, the same pattern will hold true for primate origins—the entire assemblage of "primate traits" will break down into a chronological sequence of adaptive shifts if the fossil record ever becomes sufficiently dense. It has been suggested that "If the first euprimates had grasping feet and blunt teeth adapted for eating fruit, but retained small, divergent orbits like those of Plesiadapis. . ." [Cartmill, 1992], the terminal branch feeding hypothesis for primate origins [Sussman's hypothesis] would be supported. The fossil find presented here is consistent with the hypothesis that early euprimates evolved grasping first and convergent orbits later . . . and inconsistent with the visual predation hypothesis." Carpolestes contributes an important paleontological sample to our pool of experimental runs showing an incomplete assemblage of "primate-like" traits, and phalangeroids provide additional living samples. Primate-like traits can be found in just about every phalangeroid, but developed to varying degrees (or in other words, phalangeroid-like traits occur in most prosimian primates). One advantage of looking at the phalangeroid radiation as a whole, or at ecological communities of phalangeroids (Lindenmayer, 1997; Smith and Ganzhorn, 1996), rather than at a single "primate-like species" is that the radiation represents the complex, diverse outcomes of many evolutionary trials, any one of which is potentially relevant in one or another way to the adaptive features believed to be important for primate origins—orbital convergence, eye size, color vision, grasping hands, diagonal footfall patterns, large brains, slow development, and low metabolic and reproductive rates. Many parallel evolutionary runs are more useful than just one or a few. A complex radiation of organisms alive today offers great potential to understand the diverse, nested hierarchies of sequential adaptive radiations through time that must have occurred in the origin of primates. Indeed, at a broader taxonomic scope, the phalangeroids make fascinating comparisons to plesiadapiforms, dermopterans, and scandentians. At an extreme, reductionist, cladistic level, the origin of primates could be traced (theoretically) to a single speciation event, but from the point of view of the origin of primate adaptations, such a view is simplistic and insufficient. The greatest convergence of primate-like traits occurs in the small-bodied omnivores, Gymnobelideus, Dactylopsila, and Petaurus and the miniature flower specialist Cercartetus. These observations clearly offer broad support for the idea that primates, too, may have diversified as terminal-branch-foraging omnivores making significant use of flowers, fruits and the associated insects (Rasmussen, 2001; Sussman, 1999). More specifically, our current knowledge of the phalangeroid radiations suggest that primate-like hands with great prehension, reduced claws, and expanded tactile pads, evolved in flower specialists and other small-bodied forms that utilize small-diameter supports in terminal branches or fine undergrowth. This observation is consistent with recent research on the evolution of the primate hand (Hamrick, 1998, 2001; Lemelin, 1996, 1999). Visual convergence is found among animals that move actively in arboreal, terminal branches harvesting angiosperm products and catching arthropod prey found there. The dasyurid marsupials, which were not discussed in this paper, are small-bodied predators but not arboreal angiosperm users; they may provide a good test in comparison to pha-langeroids that might untangle how insect predation on the ground differs from insect capture at fruit and flowers in terminal branches (Righetti, 1996). We believe that some of the hypotheses being considered in the symposium can be examined further by research on living marsupials. For example, do any other marsupials besides Caluromys have diagonal-sequence walking gaits and, if so, how does this relate to their use of supports? How are the adaptations for grasp-leaping distributed among phalangeroids and does this represent one or a number of distinct ecomorphological locomotor modes? What is the distribution of traits such as hypometabolism, or various forms of color vision? How do primates and phalangeroids that are similar ecologically differ from each other? 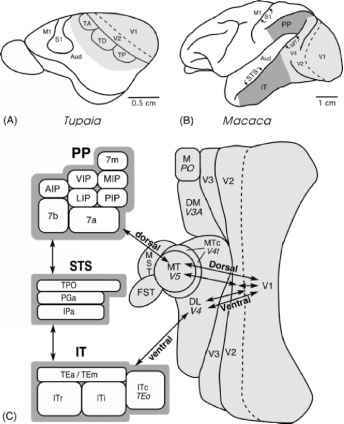 Morphological analyses of phalangeroids in an ecological context have lagged behind the growth of comparable information on primates, a problem lamented by Szalay (1994, p. 248): "The osteologi-cal aspects of the living phalangeriforms...have not been adequately analyzed from an ecomorphological perspective A great deal of ecological and behavioral information, to be obtained from focused observations, is still missing." What are the assemblage of traits in primates?